Excellent idea! Thanks for sharing Wendy! I have not seen that soap before here. And yes, the packaging is beautiful. Wendy, they are super cute. Who wouldn't be happy to get a gift like that. Especially as you made them yourself. Hi Wendy, what an interesting post. I never knew loofahs were grown. I don't know why, I thought loofahs were harvested from the sea. I am sure your friends and family were touched by your creativity and thoughtfulness towards them and towards the environment. I lova that loofa. You are so creative! 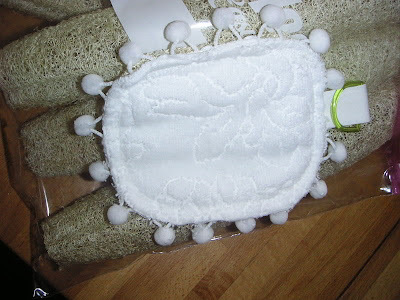 I have heard that a loofah can help with cellulite, I think I will be needing a pillow sized loofah after the holidays , Ha. I'm impressed! I had no idea how those were made. They make great gifts...very cute! I'm impressed, too! What a fun project! This is awesome! So totally up my alley, I think I'm gonna hafta give it a try. :o) Thanks for such a unique and interesting post. Yes, fun and easy. These gourds grow so fast during the summer - Julie, you could get the kids out there to measure - and with the female/male parts, could provide quite the botany lesson! I think people get these confused with natural sea sponges, but yeah, luffa or loofah grow on vines! Rosey - I hear ya! I heard about luffa but really never knew about them. Thanks for sharing it - now I know they come from gourds. Do you have a picture of the gourd? Your gift recipients are lucky to have you in their lives. 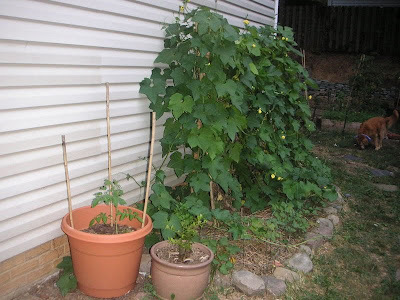 Glad to discover your blog through My Little Vegetable Garden. 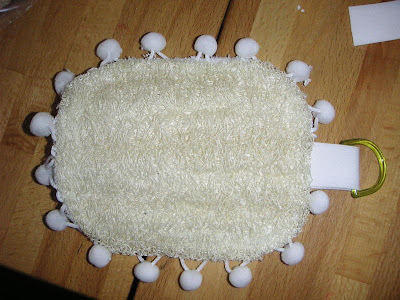 I find that DIY sponge you made from luffa is very creative. Only see those sold in Body Shop! Didn't know one can DIY it. 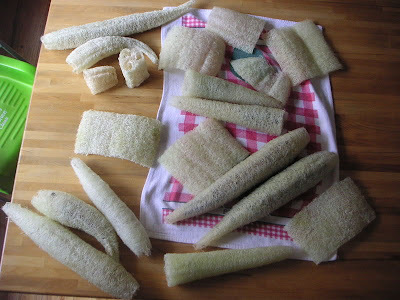 My brother sells luffa in our grocery shop and it's well-received by the locals who mainly use it for washing dishes. We use it for scrubbing our bodies, instead! What a great post! I had no idea where luffa sponges came from. I thought they were some kind of sea creature. I am serious. I am going to look for these to plant, I am so excited about this. Thanks for the info and the link t the information page. The sponges you made are so awesome. Thanks again! James, I did have some photos of the gourds but I can't find them. They basically look like gigantic cukes - pretty light in weight though towards the end of the season. Grace, there's something about the fragrance of roses that just reminds us of special people. I'm sorry to hear about the loss of your friend. 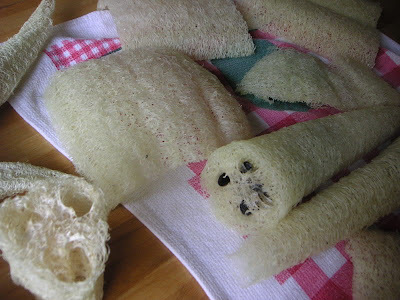 Teresa - this is what I originally thought too - but I guess this is the natural sea sponge we're thinking of, not the more scrubby, exfoliating sponge that the luffa is. Yeah, that luffa.com site is great! Lynn, it's a beast and no doubt you'd grow a gazillion sponges! We have a lot of loofah sponge for sale in the local markets.I just bought one for Rm2.00.Cut into two pieces,one for wet kitchen and the other one for toilet sink. I would like to know if loffah gourd gives products all the year or only seasonally? in my zone, the vine is killed by frost. At that point, any remaining fruits on the vine are already mostly dried out.